In this review we take a look at the best Bluetooth marine speakers that are designed to produce incredible sound performance in outdoor open spaces and are fully waterproof for boat installations. These speakers are specially built with wireless Bluetooth connectivity so that you can stream music directly from your smartphone device to the speakers – do note that some of these speakers come with a built-in Bluetooth receiver for easy installation. They are also designed with waterproof construction and are capable of being exposed to splashes of water and sunlight without any damage to the internal circuitry and acoustic components. Furthermore, these Bluetooth marine speakers are easy to install and setup, and deliver great sound quality with good bass and volume. If you are looking for Bluetooth marine speakers to install in your boat with great sound performance, so don’t forget to check out our top picks below! The BOSS Audio MR6Ws are high performance Bluetooth marine speakers that come together with a Bluetooth receiver to deliver crisp audio performance. They are weatherproof speakers designed to be installed in your boat and come with an installation kit which includes the receiver, one pair of MR6W 6.5” speakers and an MRANT 10 Marine Dipole Antenna for radio. These speakers supports wireless Bluetooth audio streaming from apps such as Spotify or Pandora, and can also support USB, mp3, WMA, AM/FM radio with auxiliary inputs from mp3 players. The pair of speakers are IPX6 weatherproof with UV coating which protect the speakers against rain and splashes of water. The MR6Ws are 6.5” 2-way full-range speakers with dual cones can deliver up to 180 watts of pure sound per pair (90 watts RMS). They are also relatively easy to install and mounts in a 3” hole in your boat with front and rear outputs. 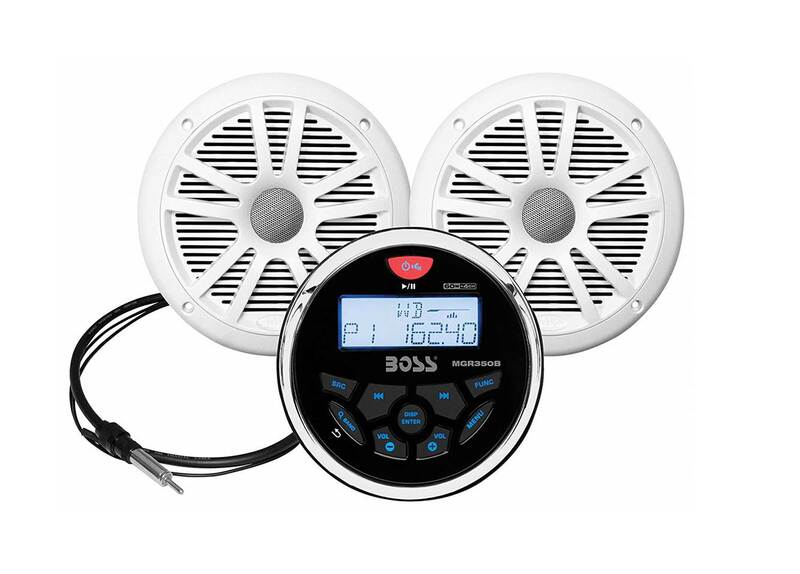 If you are looking for a set of Bluetooth marine speakers that can deliver solid sound performance in your boat with AM/FM radio tuning, the BOSS Audio MR6Ws come highly recommended. The sound quality of the BOSS Audio MR6Ws is superb and they deliver a tonne of volume output – enough volume to drown out noisy boat engine noises. The sound quality that we got from these speakers is crisp, clear and detailed. 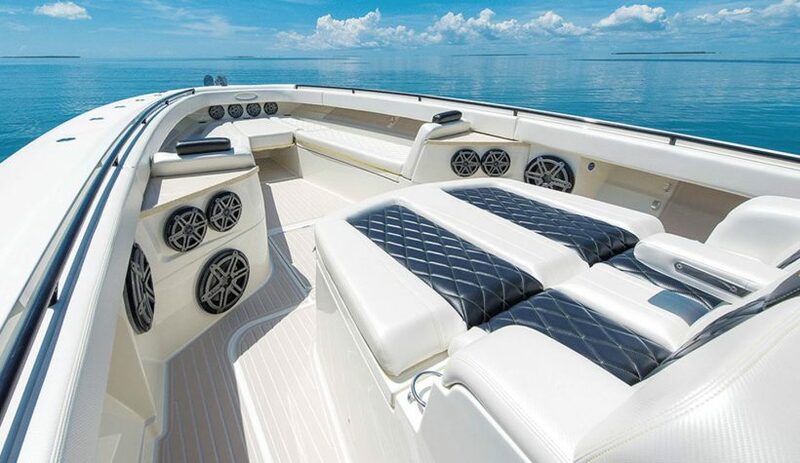 We did not experience any harshness or dips in sound quality while streaming music through the wireless Bluetooth connectivity, and the auxiliary inputs on the boat speakers work just as well. We liked how smooth vocal performances on the MR6Ws sounded, with very crisp details and nice highs. Furthermore, the midranges on the speaker are well-defined and can be heard clearly in classical and country folk music. Our only quibble with the BOSS Audio MR6Ws is that it is somewhat lacking in bass response, although the lower-midrange frequencies do have plenty of depth to them. We liked the fact that the BOSS Audio MR6Ws deliver 90 watts RMS with 180 watts combined of sound, which is more than enough to rock your entire boat. The AM/FM radio works just as well and the sound quality is decent without any static interruptions. The marine diploe antenna that comes with the speakers has good reception and is able to bring in quite a few stations while in open water. The Verdict? The BOSS Audio MR6Ws is one of the best Bluetooth marine speakers that delivers full-range sound quality and a maximum power output of 180 watts. They are very easy to install and radio receiver fits in nicely in the speedometer gauge of your boat for easy reach and convenience. The wireless Bluetooth connection works great as well and we were able to stream music directly from Spotify and Pandora without any issues. We also liked the fact that you can add a USB or auxiliary input depending on your requirements. The MR6W speakers have an IPX6 weatherproof rating and UV coating which protects it against splashes of water and exposure to outdoor elements. The speakers are 6.5” full-range marine speakers with a poly carbon cone and rubber surround for added durability. Overall, it’s one of the best Bluetooth marine speakers available for boat audio installations and we highly recommend them. The Pyle PLMRKT9 are a set of Bluetooth marine speakers that deliver superb sound quality with 240 watts of maximum power. These speakers feature a marine-grade construction with an IPX5 waterproof rating for resistance against rain and splashes of water. It also comes with a receiver with built-in Bluetooth for hassle free wireless music streaming, and an auxiliary input connector jack to connect and stream audio from external music devices and mp3 players. The speakers provide smooth and consistent sound performance while installed in your boat. The receiver features simple digital touch controls with LED connection indicator lights; you can also connect the marine speakers to your on-board stereo components for high quality sound and custom boat music applications. We also liked the fac that these speakers mount flush for simple installation and blend in nicely into your boat or yacht interior décor. The speakers come with a pair of 6.5” reinforced polypropylene cones with suspension cloth for durability. 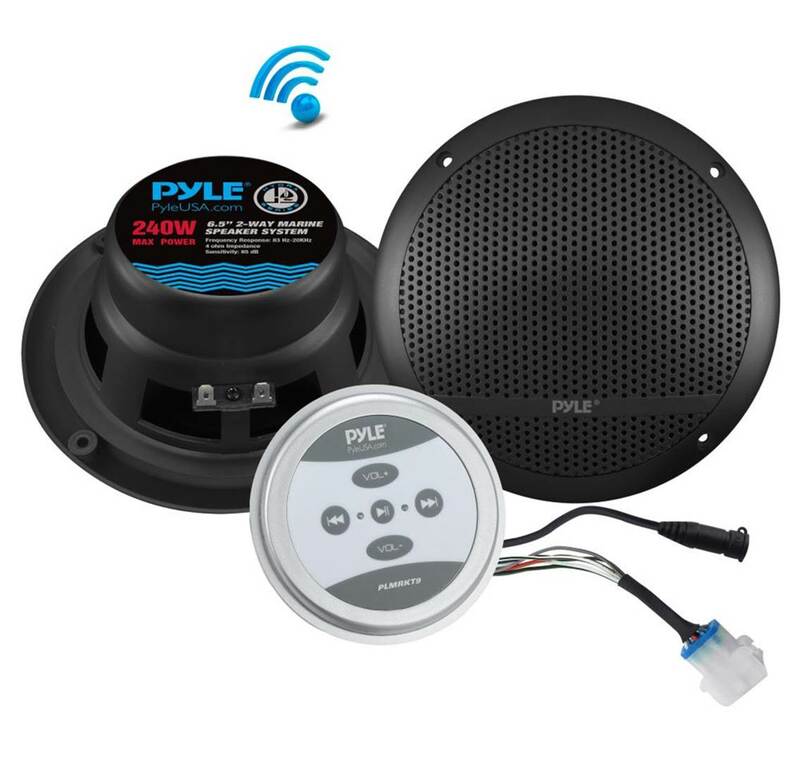 The entire package includes all the necessary installation cables and wires to help you get started to install the Pyle Bluetooth marine speakers and is simple to setup. The sound performance of the Pyle PLMRKT9 far exceeded our expectations – the speakers can pump out a whopping 240 watts of pure audio quality and it gets really loud. The sound from the speakers gets loud enough to cover out background engine noises and you can hear music and vocals clearly with these speakers. 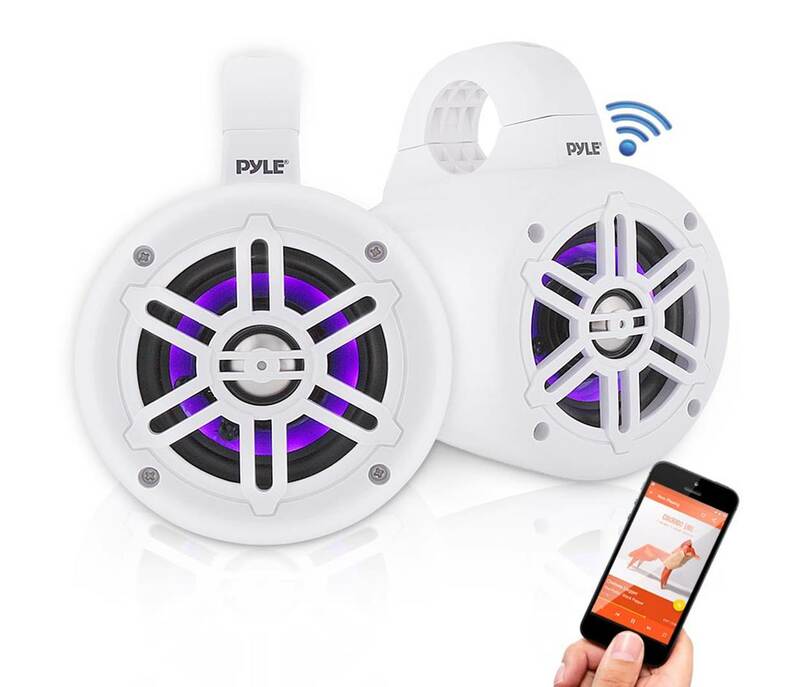 The wireless Bluetooth connectivity on the Pyle speakers works like a charm and can stream music from iTunes or Pandora without any issues. The wireless Bluetooth range is really good and we did not experience any lag or dips in sound quality while streaming music from our smartphone device. We also liked the fact that you can crank up the volume on the Pyle speakers without hearing any distortion which is a nice added plus. Vocal performances sounded crisp and crystal clear, and the level of stereo separation that you get from both speakers is reasonably good. The highs and timbre ranges are rich and well-defined, and the speakers also produce a surprising amount of bass response at the lower end which enhances the overall impact and sound quality. 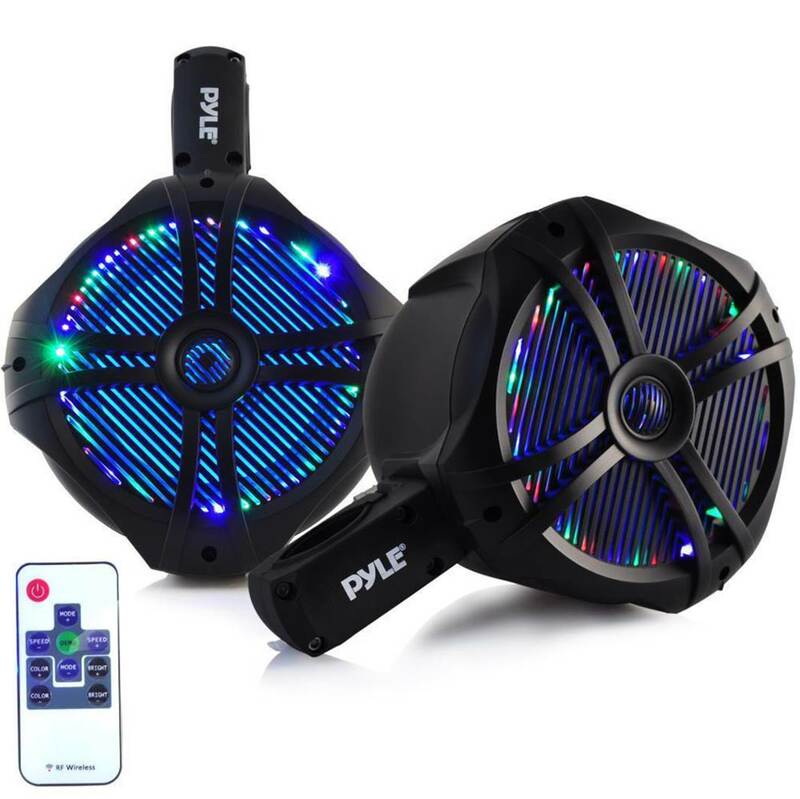 If you are looking for Bluetooth marine speakers that will excel in sound performance, the Pyle PLMRKT9s are a great choice. The Verdict? The Pyle PLMRKT9s are Bluetooth marine speakers that deliver 240 watts of pure sound quality and punch above their weight. They are very value for money and also feature a IPX5 waterproof marine grade construction with UV coating for resistance to splashes of water and outdoor elements. We liked the fact that it comes with a receiver which supports Bluetooth and auxiliary 3.5mm inputs for hassle free wireless music streaming – you can enjoy smooth and consistent sound performance while in your boat. It also has simple touch controls with LED indicator lights that allow you to pause/play music and adjust the volume. It is also small and compact enough to be installed on the boat speedometer gauge. The speakers also mount flush and blend in nicely into modern boat interior décor. They come with 6.5” of reinforced polypropylene with suspension cloth and also comes with the installation cables and wires for easy setup. Overall, the Pyle PLMRKT9s are high quality Bluetooth marine speakers that deliver superb sound and we highly recommend them. The Pyle PLMRKT36WT comes as a pair of 5.25” Bluetooth marine speakers with a Bluetooth audio receiver. 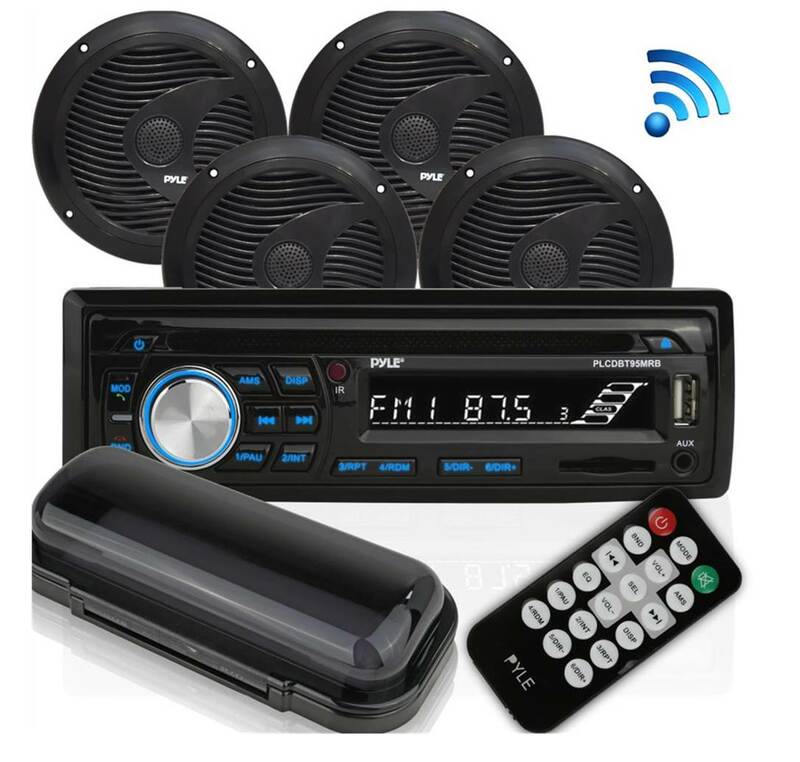 The Pyle marine receiver and speaker kit comes with AM/FM stereo radio tuning and features USB flash and SD memory card readers with auxiliary (3.5mm) input connections to connect and stream audio from external devices. The receiver has LCD and button controls with tag sound readout for artist name or sound title in the LCD display panel. It also comes with an illuminated front panel button control with rear panel RCA and present equalizer settings. The receiver also has built-in Bluetooth for wireless music streaming and even a front-panel microphone for hands free calls – it is compatible with virtually any Bluetooth enabled devices including iPhone, android, iPods and smartphones. The system comes with two 5.25” speakers with marine grade waterproof construction – each speaker has a 4 ohm impedance rating, 20 oz circuit magnet and 0.75” aluminium voice coil for durability. The speakers have a frequency response of 100 Hz to 18 kHz which is pretty wide and has good coverage. The head unit receiver has a 300 watts peak power and supports USB/SD memory cards up to 32GB, and comes with all the power wiring for easy installation. If you are looking for some of the most versatile Bluetooth marine speakers with an integrated receiver, the Pyle PLMRKT36WT comes highly recommended. The sound quality of the Pyle PLMRKT36WT is really crisp and crystal clear. The level of stereo separation that you get with these speakers is very good, and you can hear distinct notes between the left and right speaker channels. The receiver unit provides plenty of power to the speakers and you can blast music in your boat without hearing any distortion. The speakers produce enough volume to cover loud engine background noises and have good stereo soundstage. Vocal performances on the Pyle marine speakers sound crisp and smooth, while the highs and midranges do not have any harshness but sound refined. The lower-midranges performances are present in the music, although there are some limitations to the bass output for lack of a dedicated subwoofer. We liked the versatility that the Pyle PLMRKT36WT offers – it supports wireless Bluetooth streaming, USB/SD memory cards that support up to 32GB and also comes with a remote control which makes adjusting the music volume and changing soundtracks a breeze. The Bluetooth connectivity works like a charm and we were able to stream music directly from our smartphone device through iTunes and Pandora without any issues. 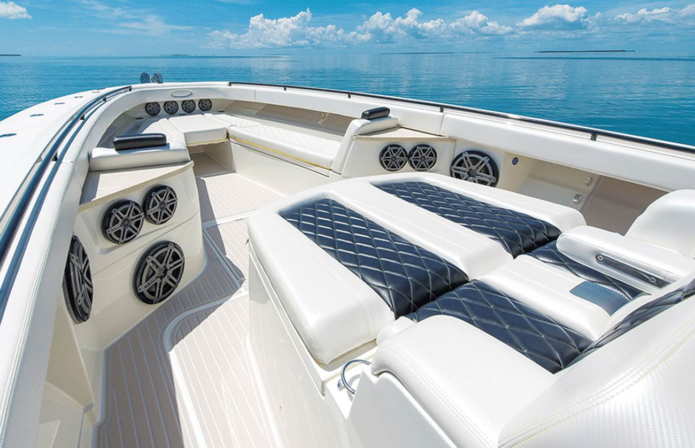 The 5.25” speakers mount flush into the boat interior décor and blends in nicely without looking too prominent. The Verdict? If you are looking for one of the most versatile Bluetooth marine speakers with a built-in receiver, the PLMRKT36WT comes highly recommended. 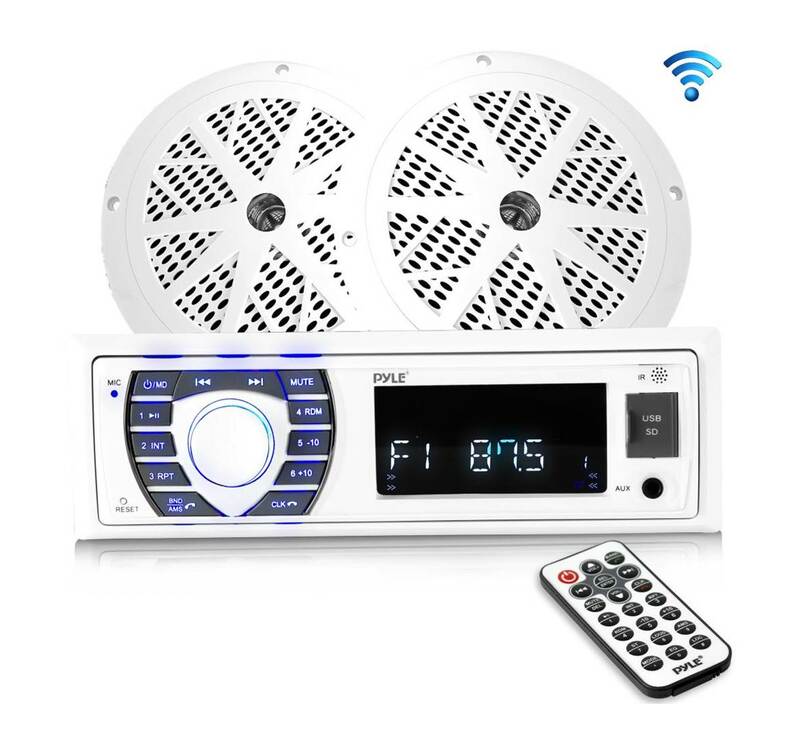 It is compatible with wireless Bluetooth streaming, AM/FM stereo radio tuning and also features USB flash and SD memory card readers with auxiliary 3.5mm inputs – this gives you a great variety of options to choose from and pair your audio device to this system. The stereo receiver that comes with the speakers has LCD display and button controls, together with present equalizer settings that allow you to adjust the sound performance according to your preferences. The speakers are 5.25” 2-way cone speakers with marine grade waterproof construction and a 4-ohm impedance rating – they perform reasonably well and provide a good amount of volume to cover engine background noise while driving in the boat. The speakers are relatively easy to install and it also comes with all the necessary power wiring to get the speakers setup. Overall, they are some of the most versatile Bluetooth marine speakers available with a Bluetooth receiver component and we highly recommend them. 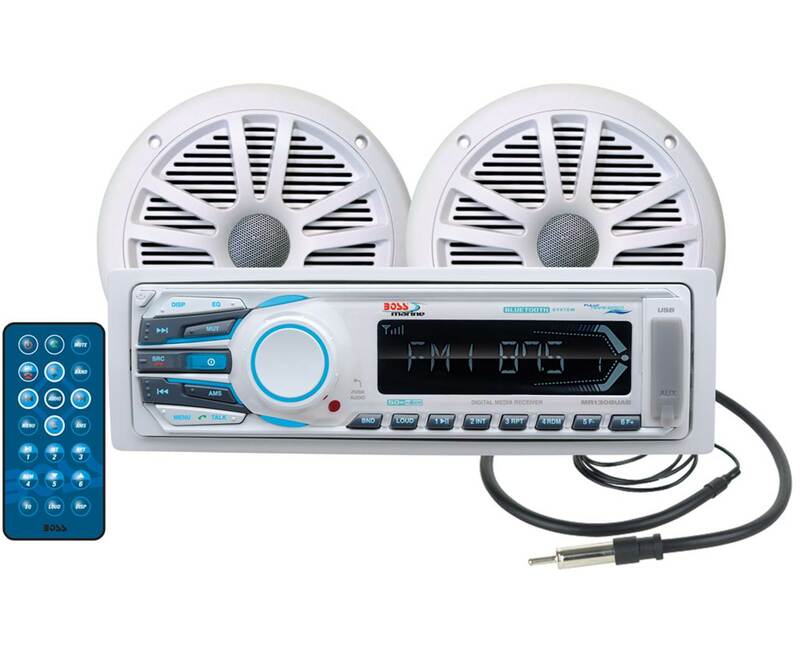 The Pyle PLCDBT95MRB is a full audio stereo kit for boat audio installations that comes with a Bluetooth marine speaker, four 6.5” Bluetooth marine speakers, a remote control and a radio shield. It’s a full sound system that you can install in your boat or yacht that delivers full-range sound quality with a CD player and slots for mp3, USB and SD card reading. You can also use this setup for AM/FM radio which is a nice added plus. The Bluetooth marine speakers feature a full-on marine grade construction that is water resistant with UV coating to protect against exposure to sunlight. The receiver is designed as an in-dash console which can be easily installed and are standard OEM sizes for easy upgrade. The receiver also features wireless Bluetooth connectivity and works with all smartphone Bluetooth devices with a range of up to 16 feet. We liked the fact that this system comes with powerful 6.5” speakers at 50 watts RMS each with a 4 ohm impedance and 80 Hz to 18 kHz frequency response – with a total combined output of 200 watts. The Pyle speakers also have a built-in microphone for easy and hassle-free hands free calls. The system also comes with a water-resistant radio shield face cover for weather-resistant protection. Overall, the Pyle PLCDBT95MRB is a combination of high performance Bluetooth marine speakers and a powerful Bluetooth receiver, and we highly recommend them. The sound performance of the Pyle Bluetooth marine speakers is really good, with the four 6.5” speakers delivering high-fidelity sound while streaming music from Bluetooth. The radio functionality on the receiver works like a charm and is able to pull in multiple AM/FM stations without any static interference. The stereo sound quality on the Pyle speakers is great – you get decent sound separation and very crisp vocals with nice frequency ranges. While it’s difficult to measure the exact sound fidelity on open waters, the sound performance of the Pyle speakers measures up to its more expensive counterparts with crisp vocal performances and a 80 Hz to 18 kHz frequency response. The combined output power of 200 watts from these speakers is loud enough to drown out engine background noise while driving in the boat. Furthermore, the receiver comes with built-in CD player functionality, USB and SD memory card readers which makes the system highly versatile to use. The remote control that comes with the speaker set also makes it convenient to adjust the sound settings and volume on the go. If you are looking for a full-fledged four speaker audio system to install in your boat or yacht with very good soundstage and stereo sound quality, the Pyle PLCDBT95MRB is a great choice. The Verdict? The Pyle PLCDBT95MRB is a formidable combination of four 6.5” Bluetooth marine speakers and a versatile Bluetooth receiver. 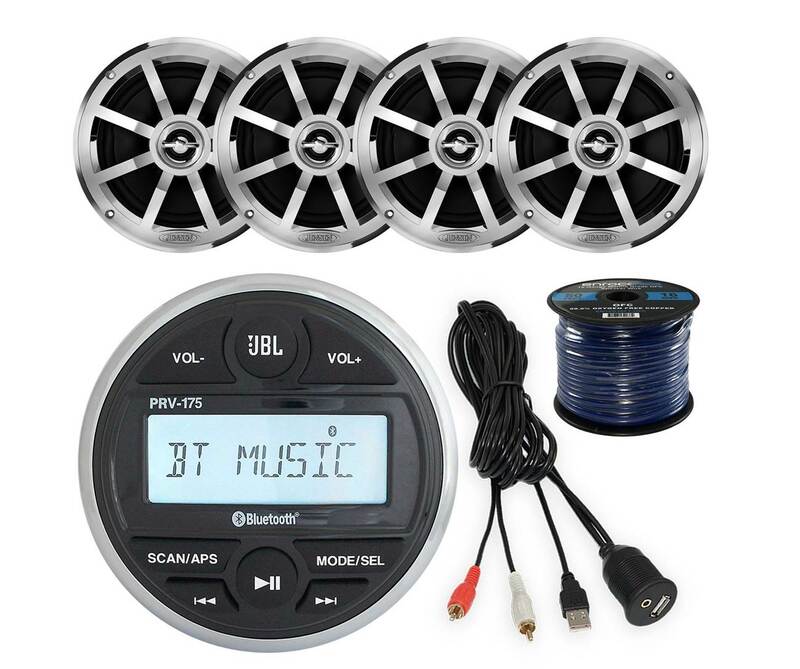 They work great for all boat and watercraft sound system setups, and the included Bluetooth stereo receiver and waterproof speakers are perfect for on-boat audio installations with universal mounting ability. The 6.5” speakers are marine grade and weather-resistant which allows them to be exposed to rain or splashes of water without any issues. The speakers and the receiver were designed with OEM parts in mind to allow for quick and hassle-free installation. The receiver unit provides wireless Bluetooth streaming capabilities, including built-in microphone for hands free calls with AM/FM radio with 30 station memory, USB flash and SD memory cards and auxiliary 3.5mm inputs. The console comes with an LCD display which provides the song and track title and it also comes with a remote control which you can use to adjust the sound settings. We also liked the fact that the system includes a water-resistant radio shield face cover for weather-resistant protection. Overall, they are some of the best Bluetooth marine speakers we have tested and highly recommend them. The Kenwood KMR-D372BT and Bluetooth marine speakers offer a great combination of music sources with crystal clear sound quality. 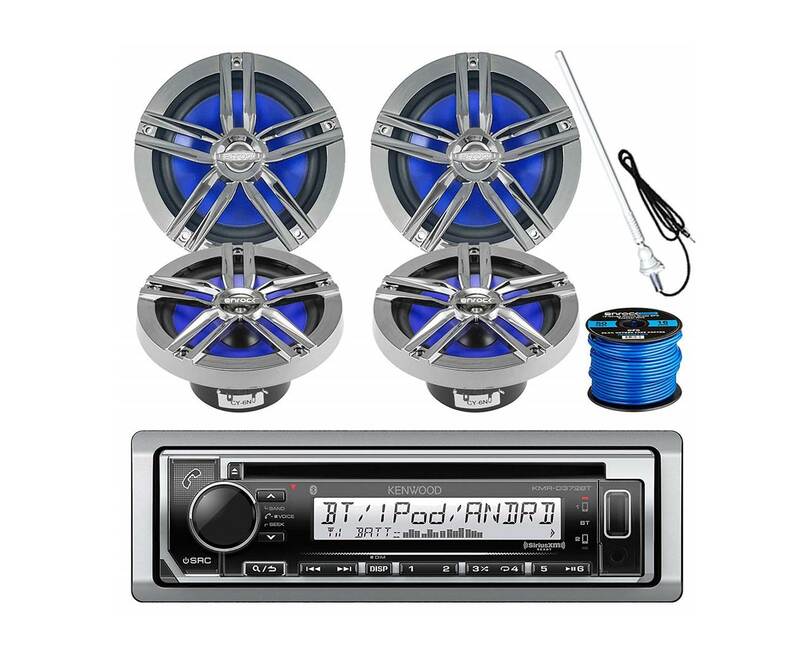 The entire package includes the KMR-D372BT Bluetooth receiving with CD/AM/FM digital support, four 6.5” marine speakers with an included 50 feet marine speaker wire, and a Enrock radio antenna for AM/FM channels. The audio receiver provides an abundance of music sources including wireless Bluetooth streaming and has a conformal-coated circuit board which protects the unit from moisture and keeps out salt and water sprays. The Bluetooth marine speakers have a rugged and durable design – they are made of weather-resistant material with a solid construction that protects them against the outdoor elements and splashes of water. The speakers feature a corrosion-proof basket that resists deterioration from salt, moisture and UV rays, while the non-removable grille protects the speaker and maintains a unique chrome finish which looks pretty sleek. The speakers have a AM/FM radio antenna which you can use to pull in multiple radio stations at a time. It also comes with a 16 gauge 50 feet stereo marine grade speaker wire for easy installation. Overall, this setup consists of some of the best Bluetooth marine speakers that provide crystal clear sound quality with a Bluetooth receiver for wireless music streaming. The Kenwood KMR-D372BT and Bluetooth marine speakers are relatively easy to install and sound great straight out of the box. The four 6.5” speakers work in tandem to produce very clean and crystal clear sound quality with crisp vocals and smooth highs. They can produce a tonne of volume – loud enough to cover up engine background noises and the lower bass response punches deep. The speakers have plenty of bass response and very respectable highs that sound crisp without any harshness. The level of stereo separation that we got with these Kenwood speakers is also impressive, and you can hear the distinct mid tones and details in the music with relative ease. We liked the fact that you can also adjust the EQ settings on the Bluetooth receiver to vary the sound output according to your preferences. Even without a dedicated amplifier, these speakers produce a tonne of volume without any distortion and the wireless Bluetooth connection works like a charm without any dips in sound performance. It’s a 200W system that lives up to its reputation and adds full-range sound performance to your boat or yacht audio. The Verdict? The Kenwood KMR-D372BT is one of the best Bluetooth marine speakers we have tested that comes with a versatile Bluetooth receiver. The entire system comes with four 6.5” marine speakers and an antenna for AM/FM radio stations. The Bluetooth receiver works like a charm and connects easily to Bluetooth mobile devices to stream music – it also works with Spotify and Pandora. The 6.5” speakers feature a sleek looking corrosion-proof basket that resists deterioration from salt, moisture and UV rays and the non-removable grille maintains a very nice chrome finish which adds to the boat interior décor. The Bluetooth receiver is also relatively easy to install and comes with a conformal-coated circuit board which locks out the moisture and protects the unit from exposure to outdoor elements. We also liked the fact that the audio system comes with a 50 feet marine speaker wire to help you get started right away. Overall, the Kenwood KMR-D373BT system comes with some of the best Bluetooth marine speakers available and we highly recommend them. The Boss MGR350B comes with Kenwood 6.5” Bluetooth marine speakers and is a boat audio combination that delivers crisp and clear sound quality. The Boss MGR350B has a Class AB 4 ohm stable amplifier with a peak output power of 60 watts X 4 channels and 40 watts X 4 channels RMS. It can deliver a frequency response of 20 Hz to 25 kHz and is marine IPX6 rated for protection against water and salt. The speakers are 2-way 6 1/2” with grilles and injection-molded polypropylene cone woofers with rubber surround sounds, and 1” balanced-dome tweeters. It also features UV resistant fixed grilles for protection against exposure to sunlight. The speaker has a power rating of 50 watts RMS (150 watts peak power) and a frequency response of 60 Hz to 20 kHz with an impedance of 4 ohms. The setup also comes with a rubber marine antenna with an AM/FM tuner with 12FM/6AM presets. The audio Bluetooth receiver comes with a rear USB port for USB playback, 1A charging, rear RCA auxiliary input and supports mp3/WMA playbacks. The wireless Bluetooth streaming supports A2DP profiles and advanced audio distribution profiles which allows high quality audio performance with basic remote control functions via Bluetooth. Overall, it’s a boat audio system combination with Bluetooth marine speakers and receiver that delivers great sound performance with a very sleek and modern durable design. The sound performance of the Kenwood 6.5” Bluetooth marine speakers, combined with the Boss MGR350B receiver, is crisp and powerful. The Kenwood 6.5” speakers can pump out very clean and crisp vocals – you can practically crank up the volume on these speakers and expect to get very little to no distortion. The speakers have a power rating of 2 X 50 watts RMS with 150 watts of peak power. The speakers are easy to mount with a flexible mast and adjustable base and setting up the system is a simple and straightforward process. The wireless Bluetooth streaming delivers consistent sound quality and supports A2DP sound profiles for a streamlined audio experience. The AVRCP AV remote control also supports basic remote control functions such as pause, play and works with most Bluetooth enabled smartphones. The AM/FM radio stations sounded very clear and pristine – vocal performances were reproduced with good accuracy, while midrange and bass tones feel full-range and have quite a bit of depth to them. We liked the fact that you can really crank up the volume on the Kenwood speakers and expect to get very little distortion – the speakers are powerful enough to fill up the boat with full-range sound and drown out background engine noise. The speakers also have a very wide frequency range from 60 Hz to 20 kHz and delivers full-spectrum sound quality. The Verdict? The Boss MGR350B receiver and Kenwood 6.5” Bluetooth marine speakers are a splendid combination that delivers full-range sound performance for boat and yacht audio installations. The entire package comes with two stereo speakers, receiver and the antenna for AM/FM radio stations. The receiver itself is quite versatile, and supports rear USB port for USB playback with auxiliary input and supports mp3 and WMA file formats. The wireless Bluetooth connectivity on the MGR350B works like a charm and we were able to stream music directly from our smartphone device to these speakers without any issues. The receiver also supports Bluetooth A2DP profiles and advanced audio distribution profiles for high quality music streaming. The Kenwood Bluetooth marine speakers have an RMS output power of 50 watts and a total of 150 watts peak power. The sound quality that we got from these speakers is crisp, with very nice vocals and clean detailed sound. The stereo separation can be heard and the left and right speaker channels can be distinguished clearly. On the whole, these Bluetooth marine speakers definitely perform above expectations and we highly recommend them. The BOSS Audio MRW6 Bluetooth marine speakers and receiver combination provide really decent sound performance on a budget. 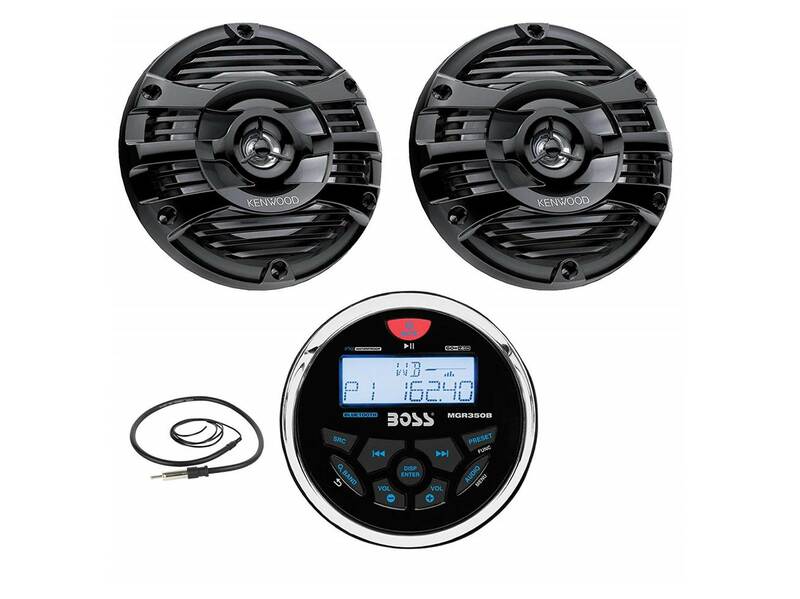 This system comes with the BOSS Audio MCK1308WB.6 combo kit, which includes the MR1308UAB receiver and one pair of MR6W 6.5” full range marine speakers with a marine dipole antenna. The receiver allows you to turn on AM/FM radio, connect your smartphone wirelessly via Bluetooth and hook up an mp3 player through the auxiliary input. It also allows for micro SD card and USB ports for digital soundtracks. The receiver comes with a detachable front panel with a wireless remote for easy navigation. The two MR6W 6.5” Bluetooth marine speakers that come with this setup are 2-way, full-range speakers with dual cones and have 180 watts max power per pair and 90 watts RMS. The marine speakers are relatively easy to install and have a mounting depth of 2-1/4 inches. The receiver also comes with a detachable front panel and Bluetooth wireless setup which allows for hands free calls, together with bass, treble and fader controls with preset built-in EQ. The receiver has 50 watts x 4 max power handling. Overall, the BOSS Audio MRW6 are really decent Bluetooth marine speakers you can find on a budget for boat audio installations and are worth checking out. The MRW6 speakers have a power rating of 90 watts RMS per pair and are capable of pumping out pretty solid audio sound performance. They are 6.5” speakers that can produce nice volume levels that are loud enough to drown out background engine noises while inside the boat. The AM/FM radio on the receiver works great and pulls in quite a number of radio stations without any issues. The sound clarity that we got from the Boss speakers is crystal clear, with nice highs and decent midranges. The timbre ranges are crisp and well-defined, with very sharp vocal performances and good instrumental reproduction. The speakers do provide a good level of stereo soundstage and separation which is great for classical or instrumental music. The only downside to the MRW6 speakers is that they are somewhat lacking in bass response in the lower frequency ranges and do not punch as deep as expected – music genres such as electronic dance music sound good but lacks the solid lower end punch which would be better aided by a dedicated subwoofer. Apart from this, we liked the fact that you can crank up the volume on the MRW6 speakers and with a 180 watt peak power, they can produce very loud volume with minimal distortion. Do note that the receiver has a power handling of 50 watts X 4 max power and you might also need a dedicated amplifier to add more power to the audio system. The Verdict? The Boss Audio MCK1308WB Bluetooth marine speakers and receiver are a great boat audio combination to have on a budget. The speakers are fully marinized and weatherproof which prevents corrosion from exposure to water and UV rays. The receiver that comes with the speakers supports wireless Bluetooth streaming and also supports USB, SD, mp3, WMA and auxiliary inputs. The wireless Bluetooth streaming works like a charm and we did not experience any dips in sound quality or lags while streaming music from our smartphone device. The pair of MR6W speakers are 6.5” full-range speakers with poly carbon and rubber surrounds for durability, and have plenty of power to deliver loud sound performance without any distortion. The system also comes with a detachable antenna to bring in AM/FM radio stations. Overall, they are some of the best Bluetooth marine speakers you can find on a budget with wireless music streaming and a versatile stereo receiver that supports multiple inputs and music formats. The Pyle Wakeboard Bluetooth marine speakers include a pair of wakeboard tower speakers that deliver superb sound quality and performance. These speakers feature waterproof marine grade rated construction and weather-resistant housing with a compact mountable design for you to easily install these on your boat. The speakers feature a 2-way full-range audio system with titanium dome tweeters and long excursion subwoofers with anti-corrosion UV resistant coating. It also comes with a built-in Bluetooth wireless music streaming receiver and works well with almost any Bluetooth compatible device including smartphones, tablets, laptops and computers. The speakers have a combined power output of 300 watts max (150 watts RMS) and have 4” subwoofers, 1” tweeters and an impedance of 4 ohms. It delivers a rather wide frequency range between 70 Hz to 20 kHz with a sensitivity of 90 dB. We also liked the fact that these speakers come with an integrated universal roll bar mounting clamp for easy installation. The speakers have an approximate size of 5.4” x 7.6” x 7”. Overall, the Pyle Wakeboard speakers are some of the best Bluetooth marine speakers we have tested for aquatic sports and boat audio and we highly recommend them. The sound performance of the Pyle Wakeboard speakers is really good considering how small and compact these speakers are. They can pump out a good 150 watts RMS of pure power (300 watts peak) and can produce enough volume to drown out engine background noises. The highs and midranges are crisp and clear, and the treble ranges can be audibly heard. The midranges have plenty of depth and make classical rock and country folk music genres sound pretty good. The speakers also come with built-in 4” subwoofers which help to enhance the lower-end bass response – although the level of bass that we experienced from the speaker is noticeably lower in outdoor open water conditions. We could stream music directly from our Bluetooth smartphone device to the Pyle Wakeboard speakers without any dips in sound quality or static interference. We liked the fact that you can crank up the volume on these speakers up to maximum volumes without hearing any distortion and they provide a relatively good boat audio experience at 300 watts peak power. The speakers also come with built-in LED lights which provide a nice vibe to the overall listening experience. The Verdict? The Pyle Wakeboard speakers are really good 150 watts RMS Bluetooth marine speakers that can deliver quality audio performance. We liked how loud these speakers can go – they can pump out 300 watts max of peak power and 150 watts RMS which is loud enough to drown out boat engine noises. The speakers are capable of producing crystal clear audio clarity with crisp highs, detailed midranges and deep lows. The bass on the Pyle speakers hits hard but does not sound too overwhelming; the midranges are solid and has plenty of depth. The highs are crisp and clear and vocal performances sound really good through the speakers. We could crank up the volume on the Pyle Wakeboard speakers to maximum without experiencing any distortion which is a great thing. The speakers feature a IP44 waterproof design and are built with engineered ABS grilles for durability. They are also relatively easy to install and come with universal bar mounting clamps for mounting on boat bars or handles. Overall, it’s a really good set of Bluetooth marine speakers that provide top-tier sound performance and we highly recommend them. The Pyle PLMRWB85LEBs are some of the best Bluetooth marine speakers you can find with a flashy LED design and marine grade construction. These wakeboard tower speakers are constructed with 8” subwoofers, 1” dome tweeters and butyl rubber surrounds for durability. It has a wide frequency range between 30 Hz to 20 kHz with sensitivity of 91dB with decent bass response. These 2-way speakers come equipped with built-in LED lights that look visually stunning – they come in 19 dynamic color changing modes with speed and color adjustments with red, blue and green with remote control adjustment. The Pyle dual 8” speaker system kit can provide outstanding sound performance with 260 watts maximum power and has an impedance of 4 ohms. It also features a IP-44 waterproof housing which are built to withstand splashes of water and rain – they are durable and marine grade for boat installations and are UV resistant. We also liked the fact that these Bluetooth marine speakers have a bullet style design and features a sleek black finish that can be discretely mounted on your boat or yacht and blends in nicely into modern décor. It also comes with an integrated mounting bracket for easy setup. The sound performance of the Pyle PLMRWB85LEBs is really good and it delivers dynamic stereo sound with pretty good bass response. These Bluetooth marine speakers are bullet-shaped which allow you to easily mount them on the boat or anywhere that you need. The highs and vocal performances on these Pyle speakers are crisp and crystal clear with great attention to detail. Music genres such as country folk and instrumental music sound very clear with decent sparkle, and the timbre ranges are clear and well-defined. The midrange performances have plenty of depth which certainly adds a lot of kick to bass-heavy music genres. The lower frequency ranges and bass impact on the Pyle speakers are also impressively deep and captivating – while they do not go as low as a dedicated subwoofer, the produce plenty of deep punchy beats for a marine grade speaker system. We also liked the fact that these water-resistant tower speakers come with built-in multi color dancing LED lights that cycle through the beats of the music and are adjustable via the remote control. The speaker system also comes with a built-in crossover network for better sound clarity and projection. The Verdict? The Pyle PLMRWB85LEBs are high performance bullet-shaped Bluetooth marine speakers that deliver full-range sound performance with 260 watts max power. They have enough volume to drown out engine background noises and sound really clean and sharp. The speakers come with marine grade weatherproof construction and come with quick connect speaker plug terminals which ensure compatibility with the stereo system. The speakers are designed to be durable and come with titanium dome tweeters, reinforced butyl rubber surrounds and extra wide diameter speaker housing projection. The LED lights look very stunning and cycle through the beats of the music to provide a visually and sonically entertaining experience. You can also crank up the volume to maximum without hearing any distortion from these speakers which is great. The wireless Bluetooth connectivity works like a charm and we did not experience any dips in sound quality while streaming music from our mobile device. Overall, these Pyle Bluetooth marine speakers deliver pristine sonic performance with a stylish bullet-shaped LED design and we highly recommend them. The Jensen 6.5” Bluetooth marine speakers and JVC Bluetooth receiver bundle provides full-range sound quality for boat audio installations. The entire package bundle includes the JVC PRV-175 Bluetooth receiver, with 2 pairs of Jensen 2-way 75 watt speakers and a 1 auxiliary / USB to RCA waterproof cable for easy installation. The JVC PRV-175 features a set of rear-mounted pre-amp outputs which allow you to install your own custom amplifier for more speaker power. It also comes with an LED display which allows you to see what you are listening to on a glade, and has a watertight UV stable face. The Jensen 6.5” coaxial speakers have a durable construction to withstand harsh elements and can pump out 75 watts of clean sound with good stereo reproduction. We liked the fact that the system comes with a USB-Aux mounting cable with a male USB plug, composite video jack and stereo RCA connectors that plug into the rear inputs of your marine receiver. It also works with all hardwired and RF remotes. Overall, the Jensen speakers are really good Bluetooth marine speakers that provide crisp sound quality and are worth checking out. The Jensen 6.5” 2-way speakers deliver pretty clean and crystal clear sound quality. At 20 watts RMS and a peak power of 180 watts, these speakers can deliver quite a good amount of volume level although they are more suited for smaller boat installations. The volume level that these speakers produce is good enough to cover loud engine background noises although you would need a stronger amplifier to push them. The speakers and receiver come with built-in Bluetooth for wireless music streaming and the speakers fits into a standard tachometer opening for easy installation. It also has rear USB inputs and rear auxiliary inputs for other music sources. The music quality while streaming from Bluetooth is pretty good, with crisp highs, detailed midranges and decent bass performance. The highs are pristine and crystal clear, and the level of stereo separation that you get with these 2-way speakers is pretty good considering that these speakers are designed for open water environments. We did not experience any distortion while cranking up the volume to maximum levels – that being said, the volume may not be as loud as expected while streaming music over wireless Bluetooth. These speakers are great for standard boat audio installations and have a durable and compact design for resistance to outdoor elements. The Verdict? The Jensen 6.5” Bluetooth marine speakers are pretty good speakers that provide crisp sound quality and decent volume. It comes with a Bluetooth receiver with built-in Bluetooth for wireless music streaming directly from your mobile device. The speakers also feature an all-aluminium heat sink and marine-rated watertight facing for resistance to water. The speakers fit in easily into a standard tachometer opening and are relatively easy to install – it also comes with rear USB input and rear auxiliary inputs for connectivity to non-wireless music sources. The required cut-out dimensions for the Jensen speakers is 3-5/16” x 3-3/8”. The receiver also comes with LED indicators and volume functionality for easy adjustment. Overall, the Jensen 6.5” Bluetooth marine speakers and LED receiver provide high performance sound quality and a sleek aluminium finish design.